Perched on a cliff, high above the River Lot, Saint-Cirq-Lapopie is a real gem among the ‘most beautiful villages’ of France. If you are walking the Chemin de Saint-Jacques du-Puy towards Santiago, the opportunity to spend a rest day exploring this delightful village is a compelling reason to follow the GR 651-GR 36 variante, rather than the traditional route along the GR 65. If you are approaching Saint-Cirq-Lapopie along the GR 36 from Bouziès, climb to the top of the bluff on your way in for a stunning view of the village and surrounding countryside. 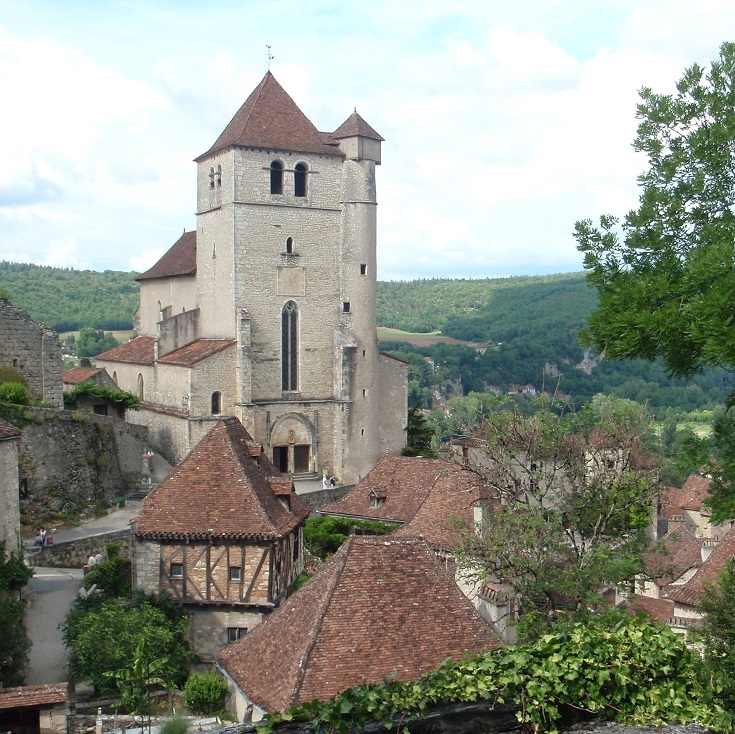 This commanding position, with views along the river, ensured Saint-Cirq-Lapopie’s place as one of the most important towns in the region during the Middle Ages. Access to the river provided a constant supply of water for tanneries and craftsmen and the river itself facilitated trade throughout France. During this time, the town prospered but was constantly under siege. From the twelfth century, fortified castles and towers protected the ruling viscounts. Evidence of this history is still apparent—the crumbling walls next to the church were once part of a keep belonging to the Cardaillac family and, as you climb up to the lookout, you’ll see the ruins of the château belonging to the Lapopies. Over the years, the castles have all but disappeared and only one of the gates, Porte de Rocamadour, remains. Dominating the skyline of Saint-Cirq-Lapopie is the sixteenth century church dedicated to Saint-Cyr and his mother, Sainte-Julitte. Cyr was the youngest of the Christian martyrs—beaten to death at the age of three to punish his mother after she attacked a Roman magistrate. Inside the church, simple white-washed walls and a rainbow of stained glass windows provide a backdrop for artwork by the Sunday School children—signs of a church well-loved and well-used by the local community. The church was built on the same ground as an earlier roman chapel and still retains some features from that time, including a twelfth century sculpture and fragments of wall paintings from the thirteenth century. 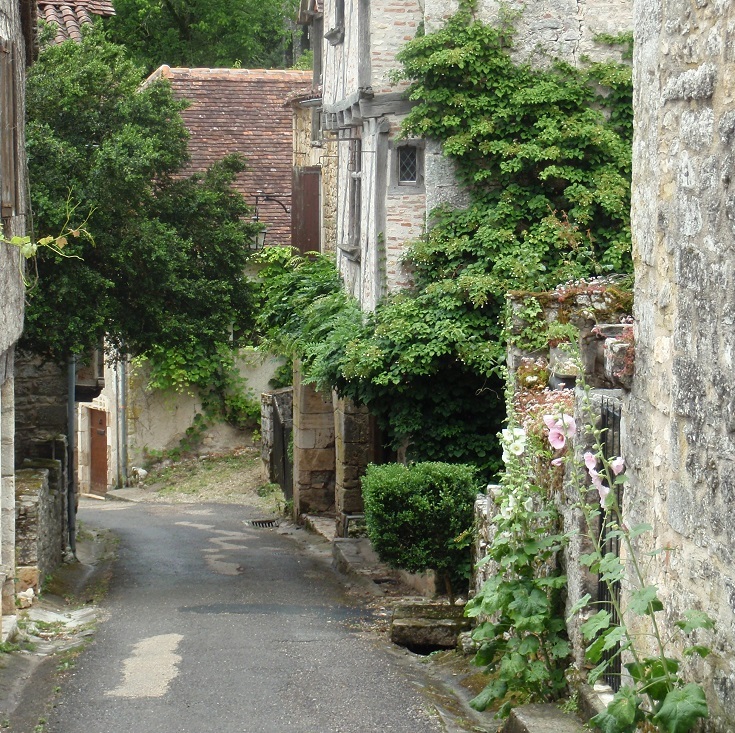 Saint-Cirq-Lapopie has long been a haven for artists with many coming in search of inspiration and never leaving. I know the cobbled streets, gorgeous stone cottages and flowering pot plants all get my creative juices flowing (if only I possessed the skill to actually create something!). 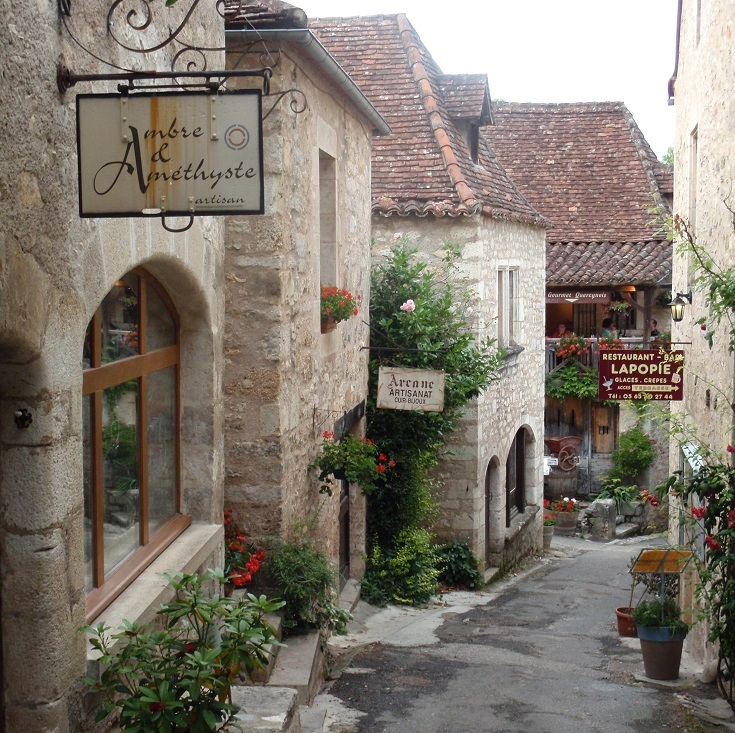 There are over a dozen galleries and ateliers (workshops, en anglais) where it is possible to see and buy works of art created locally, and in many cases, watch the craftsmen at their work. To make sure you don’t miss any, pick up a map—Sur les pas des artistes—from the Tourist Office. Once you’ve seen all the main sights, it’s time to put the map away and head down any of the narrow lanes. You’ll always have the church steeple to guide you back to the centre of the village, so lose yourself among the maze of stone cottages and timbered houses. 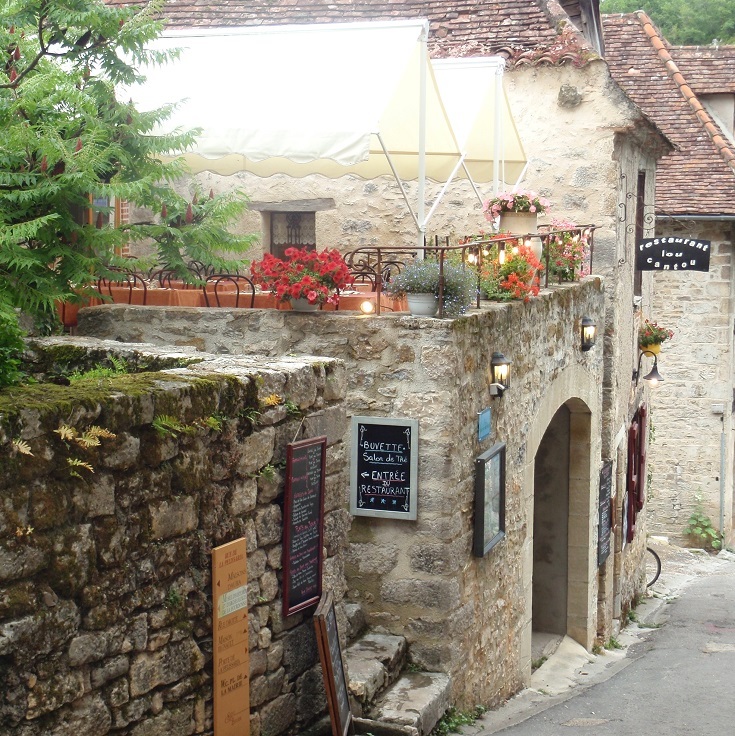 The hardest decision you will have to make during you visit to Saint-Cirq-Lapopie is where to eat. Everywhere you turn there are picturesque cafés enticing you to stop and rest awhile. For delicious, reasonably priced food in a beautiful setting, I can recommend l’Oustal and Lou Bolat. 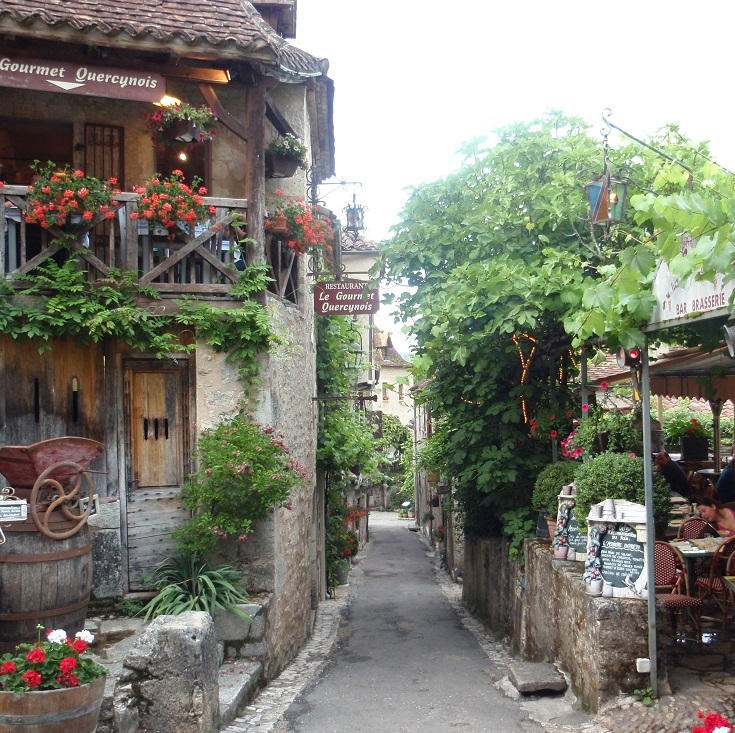 Of course, you could always stay a few days and eat your way around the village. 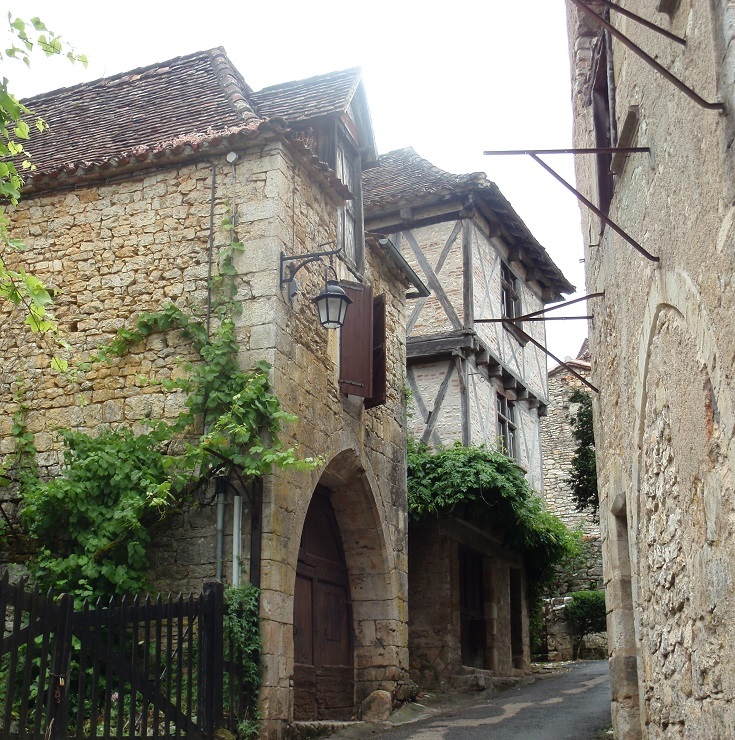 Leaving Saint-Cirq-Lapopie without a tangible reminder of your visit is nigh on impossible. If you are lucky enough to visit on a Wednesday in July or August, the evening markets are an ideal place to start shopping. At other times of the year, there are dozens of gift shops to tempt you—so give in and treat yourself to something special. With a little dedication, I am sure you’ll find something for everyone on your gift list. 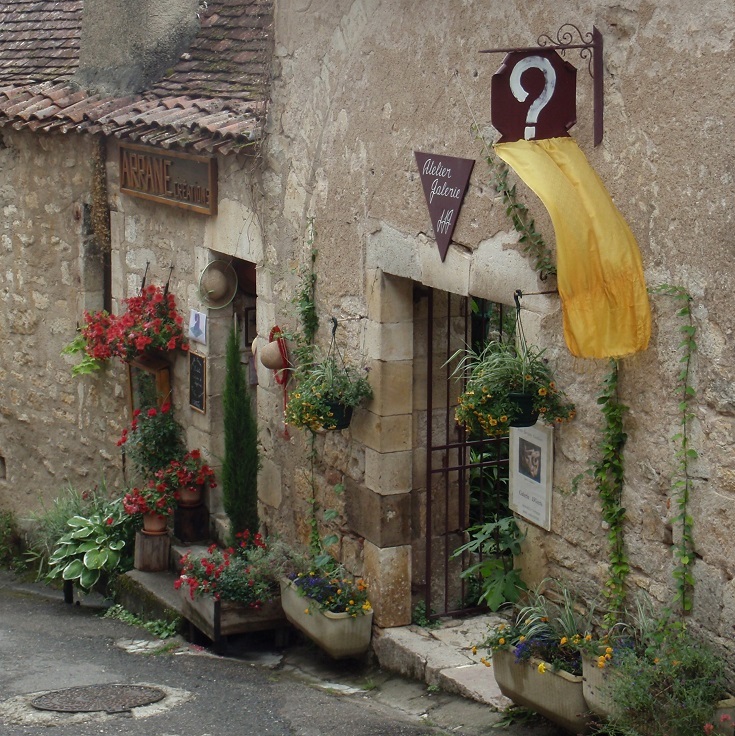 Which long-distance walk visits Saint-Cirq-Lapopie? Ah yes, I remember it well. I do like your challenge to eat your way round the village, that’s my sort of challenge. Mmm, yes, I’m sure you’d give it your best shot Richard – and enjoy every mouthful!